Adsorbed Natural Gas Products, Inc. (ANGP) is to be a proud recipient of the 2018 World Gas Conference ‘Innovation Award for the Transportation Driven by Gas’ segment for the company’s PHANGV® technology. This and a content rich with opportunities to learn more about natural gas for transportation applications demonstrates the IGU’s commitment to engage downstream stakeholders. The award will be presented during the Washington D.C. Conference on Thursday June 28, 2018 at the Award Ceremony Part II from 1:10 pm through 2:25 pm, taking place in the Technology & Innovation Center on the Exhibit Floor. 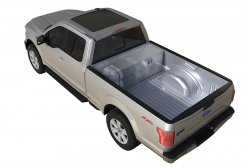 WGC 2018 will take place from June 25, 2018 through June 29, 2018 at the Walter E. Washington Convention Center in Washington, D.C.
ANGP, together with its partner Ingevity Corporation, will be exhibiting the PHANGV® (plugin hybrid adsorbed natural gas vehicle) technology installed on a 2018 Ford F150. The technology employs the science of adsorption to provide enough on-board natural gas storage at low pressure for a typical daily operational range. The exhibit will be in Booth 707 on the Conference Exhibition Floor. The IGU’s message is that by increasing the use of natural gas in the power generation and transport sectors, quality of life will be greatly enhanced, a message reflected in the program content for WGC 2018. NGV Global is the initiator and convenor of the session Global Opportunities in the Transportation Market. Diego Goldin, Executive Director for NGV Global, will lead a panel of experts in the exploration of this theme as it relates to land and sea mobility and a sustainable energy future. In addition to this session there are several other NGV-related presentations at WGC 2018. See a brief summary on NGV Global News.